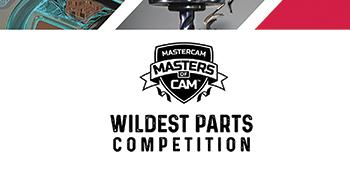 Leading CNC software developers, Mastercam recently announces that they have revamped the 2019 Wildest Parts Competition. Masters of CAM is an online platform where Mastercam users submit stories about their experience as well as skills of using CAD/CAM software to design and machine parts. This year Mastercam has revised the rules of participation for the users. In 2019, one Masters of CAM story should be submitted for entry in each part. The rules have been modified including the expansion in the competition process by adding a new division for professional Mastercam users to enter parts they created for the chance to win cash prizes and more. iv. Professional – open to everyone from professional manufacturing industry and also with experience. He further added to infer, “in general, we look for high quality, original parts that haven’t been made before or parts that are familiar yet feature a unique, new design. We like eye-catching designs that would look nice on display because we do show them off at trade shows in a special case. We get many comments on them by people all over the country. They demonstrate how impressive and innovative people can be with Mastercam, so we encourage entrants to really think beyond the norm. They may have made something like that during the past school year, or in their shop, that would qualify.” Entries for the competition should be postmarked by June 28, 2019, and sent to, Wildest Parts Competition, CNC Software, Inc., 671 Old Post Road, Tolland, CT 06084.